There really is no sure answer. You can't judge the strength of ice just by its appearance, age, thickness, temperature, or whether or not the ice is covered with snow. Strength is based on all these factors -- plus the depth of water under the ice, size of the water body, water chemistry and currents, the distribution of the load on the ice, and local climatic conditions. There is no such thing as 100 percent safe ice. 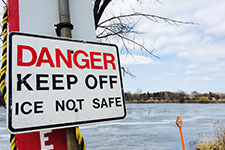 For more information on ice safety contact the MN DNR and ask for our free ice safety publications, which include the brochures, "Danger, Thin Ice" and "Cold Water Kills" and the wallet-sized reference card and 11X14 posters titled, "Minimum Recommended Ice Thicknesses." Metro (651) 296-6157 or toll free outside the metro area 1-888-646-6367 or email the Information Center at [email protected]. 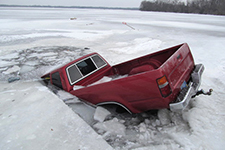 If you wish to re-use any DNR Boat and Water Safety materials from this Web site, please contact us.